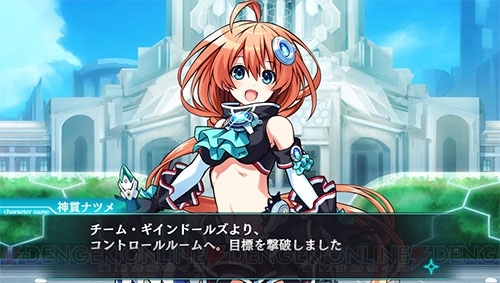 Compile Heart have revealed a brand new title exclusively for PS Vita titled Tokyo Clanpool, a new collaboration between Compile Heart and Dengeki PlayStation under a new brand titled “Den-Pool.” Character design has been handled by Manimetsu whom has done work on other Compile Heart series including Hyperdimension Neptunia. Dengeki PlayStation released several bits of information in a preview article online, which are summarised below. Set in a near-future Tokyo, an upside-down city appears in the sky with a high rising tower connecting to the National Diet Building, forming said demonic tower mentioned earlier. The monsters in this tower overflow, meaning Japan is isolated from the world. The “Cyber Tactics Cabinet” is formed with the intention of rebuilding the government and fighting the monsters. They also aim to capture the demonic tower. There are customisation systems such as the “Gadgeteers” system. This system contains spirits personified as gadgets. Dengeki PlayStation will feature world and character introductions, as well as an interview with the producer Makoto Kitano and the illustrator Minatsu. Another game system includes the ability to drill holes in walls and floors, and jump over cliffs. Dungeon exploration is live streamed to the people of Tokyo where they will judge you. A high approval rating leads to special bonuses and support money. Natsume Kannuki (voiced by Manami Numakura) – The protagonist. The Cyber Tactics Cabinet’s first Prime Minister. She is a bit sloppy and rough. Chiyo Saionji (voiced by Yoko Hikasa) – The daughter of a large enterprise. She is strong-willed and hates crooked things. She works as the Chief Cabinet Secretary. Hotaru Urushihara (voiced by Aimi Tanaka) – The lacking self-confidence and always nervous Minister of Defense. She has a timid personality and is always trying to gauge the feelings of those around her. Mikuri Kirigakure (voiced by Aya Uchida) – The quarter-foreign Minister of Foreign Affairs. She is a gentle-mannered and kind girl. She loves Japanese culture, but something feels out of place. Finally, a teaser trailer was released. You can watch it below. There is currently no mention on a Japanese release date.